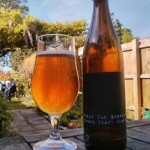 This entry was posted in Homebrew, Y-Brew and tagged Aussie Pale Ale, Cooper's, Homebrew, Willy Hop, Y-Brew by Yvan Seth. Bookmark the permalink. One week later. The brew has been at about 19-20C for the week. 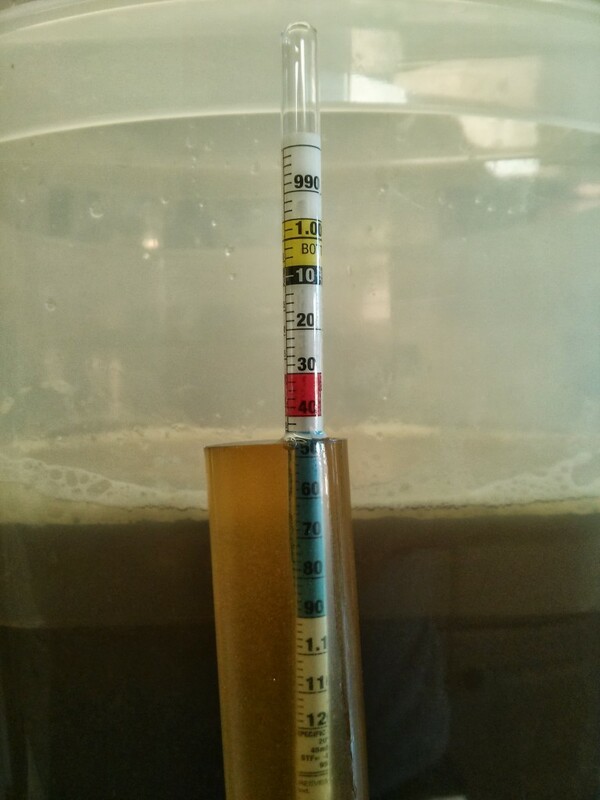 Current gravity seems to be about 1016… hoping to squeeze a bit more out of it. 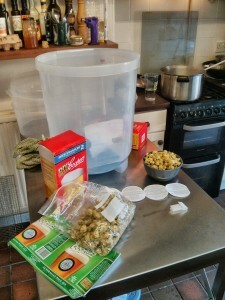 It has been agitated, shifted to a cooler spot, and 20g of chopped “Willy Hop” has been added for a dry-hopping along with a hopeful half teaspoon of yeast nutrient. Turns out of the two packs of yeast I added one was the Cooper’s ale yeast (from a stout kit) and the other wast the Cooper’s 50/50 blend of ale and lager yeasts (the one that came with the APA kit). Plan is to bottle it in about 1 week’s time. Bottling day! On Monday 17th I siphoned the beer from the fermenter into a barrel, the gravity at the time was about 1014. Since the transfer on Monday the beer has been busy and has worked down to 1009 today. Nice. Currently an ABV of just about 4.9% – and priming should push that above 5. 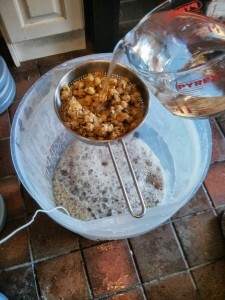 I weighed the cask and have 21 litres in there – I’ve primed in-barrel with 100g of brewing sugar dissolved in 100ml of hot water with a target of just over 2g/l CO2 (a little above the usual for a UK beer.) The gravity after priming seems to be about 1012 – hope I mixed the sugar in adequately! Bottling commenced and went by without a hitch thanks to my wonderful assistant! Mostly in screw-cap PETs, but also a handful in glass – exercising my new crown-capper and bag of nice blue lids.